Do you already use sustainably produced energy, and would like to take an active part in the energy revolution? Why not simply generate your own green energy? Do you still use conventional power for yourself and your company? If so, producing your own electricity is an alternative, allowing you to become independent from increasing energy costs and unsustainable resources. silos, for example. However, our low-noise turbines are also particularly suitable for self-sufficient supply to remote consumers in the private and commercial sector. Top-quality technology for energy generation. The rotor blades of the Vertikon small wind turbines are made of fibreglass-reinforced plastic and are equipped with a lotus effect. With their high level of quality, all turbine parts are designed with a long service life in mind. The excellent aerodynamics of the rotors guarantee an early start-up, and therefore also maximum energy yields. The control electronics have been specially developed for the VERTIKON systems. The hybrid inverter used enables additional connection to photovoltaic systems. The integrated safety system makes our turbines even more stable: it allows problem-free operation even at low wind levels, and ensures that the turbine runs safely during high winds. These high-quality individual components make this a safe investment for you, as well as ensuring a high degree of weather resistance and particularly long maintenance intervals. Every wind turbine produced by us is thoroughly examined and tested in a test procedure to ensure that its full range of functions are in order before being dispatched. Thanks to the use of the newly-developed decoupler, we can also offer you special superstructures for areas independently of roof and mast types. The vibration decoupler has been adapted to the VERTIKON turbines and decouples the wind turbines from the substructure. As a result, no more vibrations are transmitted onto the building, and dynamic loads are kept to a minimum. Whether you plan to mount your turbine on the ground, roof or on a mast, we offer innovative solutions and close cooperation with our structural engineers. You don’t need to decide on the mast height right at the start. You can choose to adapt it to your energy yields if you wish. This means that you can start right away with a 6 m mast, and extend your system to 12 or even 18 m with no complex procedure involved. Interested? Would you to have additional information? 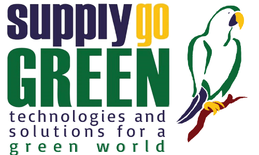 Talk to our business partner SUPPLYgoGREEN, Mrs. Simone H.